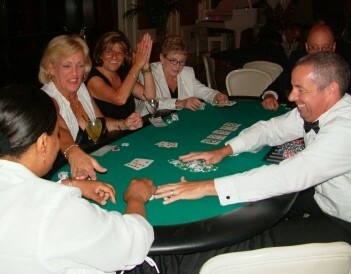 Are you interested in planning an exciting Texas Hold 'em party in Queens, Brooklyn or Manhattan, NY? New York Casino Entertainment offers exceptional casino event-planning services for poker tournaments at your next Texas Hold 'em party in Queens, NY, and the surrounding areas. Featuring superior game tables and professional dealers, our casino parties and poker tournaments will exceed your expectations! When you choose New York Casino Entertainment for casino rental equipment and professional dealers, you're receiving nothing less than first-rate services. Our pristine tables are manufactured by leading companies that supply tables for renowned casinos in Las Vegas and Atlantic City. We provide high-quality authentic chips, as well as customizable play money and Script Chips to cash at tables. Our goal is to create an atmosphere that distinctively resembles a classic Vegas experience for all your guests. Our professional dealers are trained to manage a game of Texas Hold 'em just like dealers would at any prominent casino. With more than a decade of experience, we can create poker tournaments for seasoned pros and amateur players. Our poker tournaments are designed for 8 players per table. We can provide tables from 8 up to an infinite number of guests. If you're new to the game, our dealers will happily explain the rules and teach you expert strategies. Our job is to go the extra mile to transform any home or venue into a realistic poker room for a fun and enjoyable event! Call New York Casino Entertainment in Queens, NY, for details on how we can take your next poker tournament to the next level! Our dealers and tables are available for customers in Brooklyn, Manhattan, the Bronx, Staten Island, Long Island, Westchester, Rochester and Northern Jersey.